Anees Bazmee directorial movie Welcome Back is running smoothly at box office in weekdays too. The movie has received mixed reviews from critics but still collecting nice figures worldwide. Audience find its very entertaining and again the well star-casted comedy formula is working. Critics appreciated the hilarious performance of Anil Kapoor & Nana Patekar in the movie but its ineffective script doesn’t made them satisfied. Welcome Back is the sequel of 2007’s one of the most entertaining movies Welcome, and its story is almost similar to the same concept. 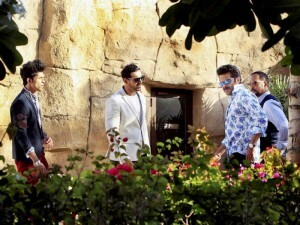 This time lead roles have been played by John Abraham & Shruti Haasan. Music & script, are the weakest part of the movie but because of Majnu Bhai & Uday Shetty it is doing well at box office. It is getting wonderful response from audience in India as well as overseas. In the first weekend, it was done the business of total 51 crores on Indian screens that includes 14.35 crores of Friday, 17.05 crores of Saturday and 19.60 crores of Sunday. On overseas screens, it was collected around 21.38 crores in first weekend. The total collection of the movie after the weekend was recorded as 90 crores including its distribution shares. From Monday, Welcome Back has been entered in weekdays and started facing drops in its business. It was minted the amount of 7.52 crores as its 4th day collection. On Tuesday it recorded slightly less occupancy than previous day and made the collection of 6.17 crores. Then on Wednesday too, the movie faced more drop and done the business of around 5.08 crores. The movie is expected to gross near about 75 crores till the end of this week.